Upon returning to his home planet of Hocotate, Captain Olimar discovers that his company is out of cash. The President of Hocotate Freight sends Olimar and his partner Louie back to the planet of the Pikmin to scavenge for treasures and rescue their company from bankruptcy. Olimar and Louie work together, splitting up across to find treasures. As well as the red, yellow and blue Pikmin, you can also find the strong Purple Pikmin and the poisonous White Pikmin. You will also head into caves, self-contained areas where time doesn't pass where many of the treasures are located. 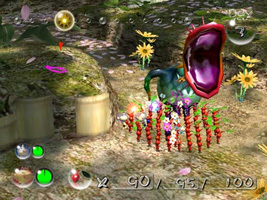 You may also have to battle huge bosses, so choose carefully which Pikmin you take with you. In a continuation of the nameplay from the original Pikmin, where Olimar's name is the reverse of the Japanese spelling of "Mario", Olimar's partner is named Louie, a shortened version of "Luigi". 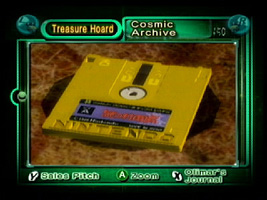 The "Cosmic Archive" is a Famicom Disk System disk. The label says the game is the obscure, Japan only title Mysterious Murasame Castle. 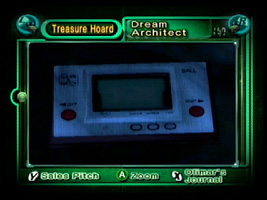 The "Dream Architect" is Nintendo's first Game & Watch game, Ball. 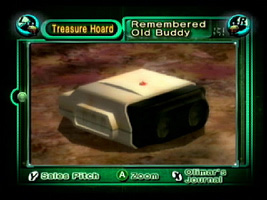 The "Remembered Old Buddy" is the head of R.O.B., an accessory for the NES. They are incorrectly titled Gyro Blocks, even though they weren't used for the other R.O.B. game, Gyromite. 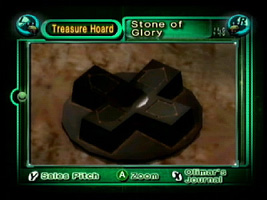 The "Stone of Glory" is the + Directional Pad from the NES Controller. Olimar says it fills him with a sense of nostalgia. 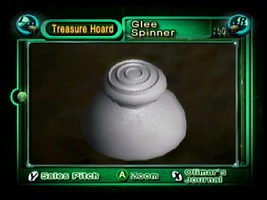 The "Glee Spinner" is the analogue stick from the Nintendo GameCube Controller. 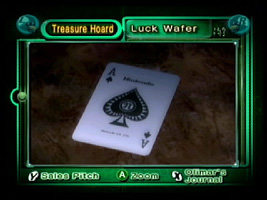 The "Luck Wafer" is a Nintendo-branded Ace of Spades playing card. Nintendo was a playing card manufacturer in Japan before moving into videogames. The "Talisman of Life" is a Hanafuda card box. Hanafuda cards were the first product manufactured by Nintendo when the company began operation in 1889. 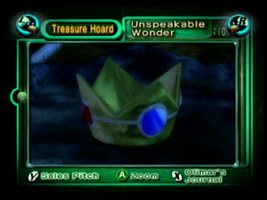 The "Unspeakable Wonder" is a crown. The design is based on Princess Peach's crown from the Mario Series. The "Flame of Tomorrow" is a box of matches. 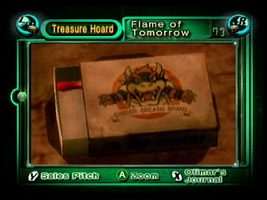 On the front of the box is a picture of Bowser from the Mario Series, and the words "Bowser Breath Brand" written underneath. The telephone number on the box reads 555-TROOPAS. 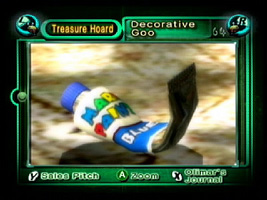 The "Decorative Goo" is a tube of used blue paint with "Mario Paints" written on it. 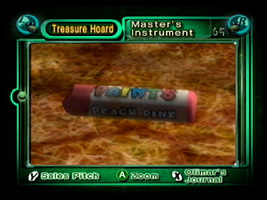 The "Master's Instrument" is a pink oil paint stick with "Mario Paints" written on it. The "Implement of Toil" is a pencil that has been sharpened down to a point. You can see the words "Nintendo 64" on it. The "Prototype Detector" is a classic Nintendo toy manufactured in the 1970's called the Love Tester. The "Time Capsule" is a locket with a photo of a Shetland Sheepdog inside. This is a photo of Pik, game designer Shigeru Miyamoto's dog. The "Network Mainbrain" is a motherboard with "N.C.L. This game is only for Nintendo GameCube" written on the side. The "Temporal Mechanism" is a clock that features the Nintendo logo on the face. Sales Pitch: Eat one of these and you'll grow twice your normal size! Perfect for skinny beings unable to pack any girth! The Gyroid Bust treasure is not a reference to Animal Crossing. Both the Animal Crossing Gyroids and this treasure are based on the Hinawa, a Japanese clay figure. Go into any cave you have not yet completed and finish it by collecting all the treasure. 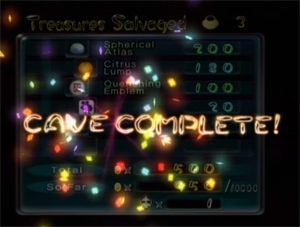 When you exit the cave using the geyser you are taken to the "Treasures Salvaged" screen, where a "Cave Completed" message and twinkling confetti appears. Wait on th Cave Completed screen for a few minutes and Totaka's Song starts playing. If you have already completed the cave, or if you failed to collect all the treasures, the confetti will not appear and the song will not play. For all appearances of this song, see the Kazumi Totaka's Song Guide.